Merlin Finale: Le Morte d’Arthur? The BBC has released the above trailer for the final episode of Merlin, to air on December 25. As the fifth season hasn’t aired in the United States yet, this is sort of a spoiler, but since the Arthur legend is well know this shouldn’t totally ruin things for those who have not seen Season 5 yet. To those who may have doubted Merlin in recent weeks, I say only this: watch the next episode. It’s a beauty, the best of the series so far. Structurally and emotionally, it’s the most satisfying, and tees up the finale in ripping fashion. Writer and co-creator Jake Michie knows better than most what makes Merlin magic, and here he’s concocted a potent brew. Yes, series five has gone walkabout from time to time, but in that respect it’s no different to any of the preceding four. And you could accuse almost any long-running drama of mid-season sag. Even the mighty Homeland! So what happens in The Day of the Diamond Part 1? 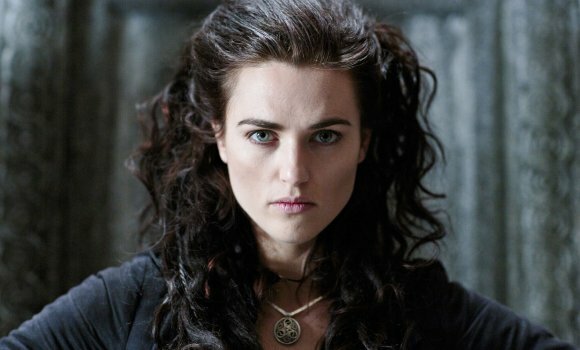 Well, without giving anything away, Morgana acts on the information that her new ally Mordred has supplied – that Merlin is actually sorcerer supreme Emrys. It’s impossible to watch Merlin without occasionally thinking of Harry Potter. And that’s no criticism. But just as Lord Voldemort would dispatch his pet snake Nagini to do his dirty work, so Morgana employs a big, magic-sapping slug to take Merlin out of the equation. In the bigger picture, M&M (Morgana and Mordred) are closing in on Camelot, so Arthur and his Knights of the Round Table must hatch a cunning plan to protect the kingdom. It sounds straightforward on paper, but there are some juicy little side issues. Even loyal, mouthy Sir Gwaine (Eoin Macken) is given a little more to do than swish a sword. There’s not quite enough for Gwen or Gaius to sink their teeth into ­– same old, same old – and the supposedly ruthless Morgana does (or rather doesn’t do) something a bit stupid. But these are minor complaints in the context of an episode that has such heart, and guts. A surprising reappearance, one quiet moment of almost poetic sorcery, an invigorating, Henry V-style pep talk and some stirring incidental music complete the package. Enjoy! Posted in Science Fiction, Television. Tags: Harry Potter, Homeland, Merlin. RSS feed for comments on this post.. TrackBack URL.